136 other birds have this item in their bag or wishlist! The subtle colours of these earrings is really lovely, they will be very versatile and the quality is excellent. Love these. Have received so many comments, which of course means recommendations and rave reviews of Birdsnest. Don't hesitate buy these, you won't be disappointed. I so love these earrings - my teenagers both complimented me on these as did my sister. Very flattering length, am going to buy some more in this style! They are also really versatile, they can look corporate or casual - very good buy. Classy earrings that are affordable and a beautiful colour. I bought these earrings for a gift and they are prefect! Thankyou Birdsnest Girls- and thankyou for making me feel like a valued customer! In love with these earrings. Such a pretty colour and just the right length. Getting so much wear out of them. They go with lots of my outfits. These earrings are divine, love them! What a beautiful shade of green. 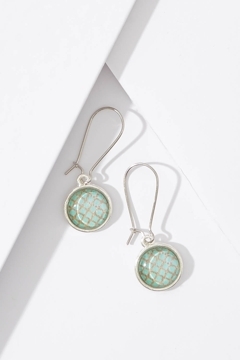 These earrings will look great with lots of summer outfits. Like the shimmer of gold through them too. Love these earrings! The other reviews were spot on and I am so glad I found these. A beautiful colour which is very versatile, will look great with my new birds nest cardigan! Lovely colour, well made earrings, they fit perfectly on my Pandora hooks as well. Very pretty delicate earrings that go with quite an assortment of outfits. A definite must.